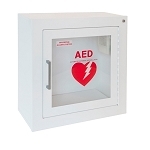 AED cabinets and brackets enable you to predominantly display your AED in a readily accessible location that increases visibility while protecting your AED. For those looking for a sturdy and aesthetic solution that enables accessible storage in a public arena, such as schools, churches, corporations, and others, an AED cabinet is strongly recommended. For those looking for a device that enables them to store their AED in a highly visible location without the need for protecting the AED, a bracket is recommended for the particular AED.